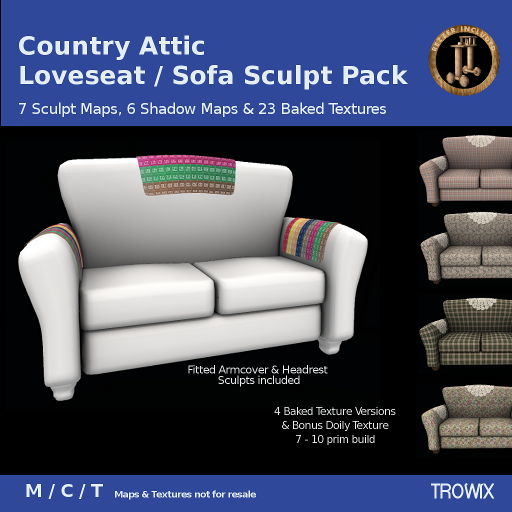 Country Attic Loveseat – Love! Casually comfy match to our other Country Attic pieces. 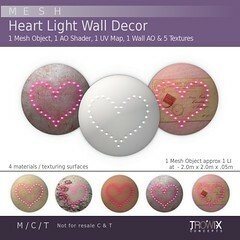 4 styles of Baked Textures & Shadow Maps for your own. This is quality for your furniture builds. 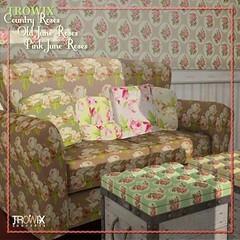 Come see all the Country Attic furniture at the Trowix Barn. 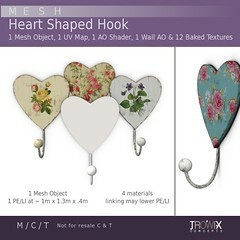 Also on SL Marketplace with free delivery! 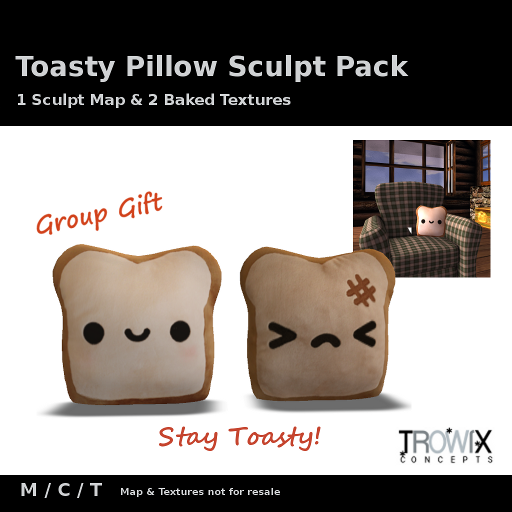 November Group Gift – Toasty! Fuzzy, plushie, cute enough to eat pillows reminding you to stay toasty warm as the cold weather approaches. 1 Sculpt Map, LOD 2, and 2 baked textures – one nicely toasted, one a little burnt. Stay Toasty! 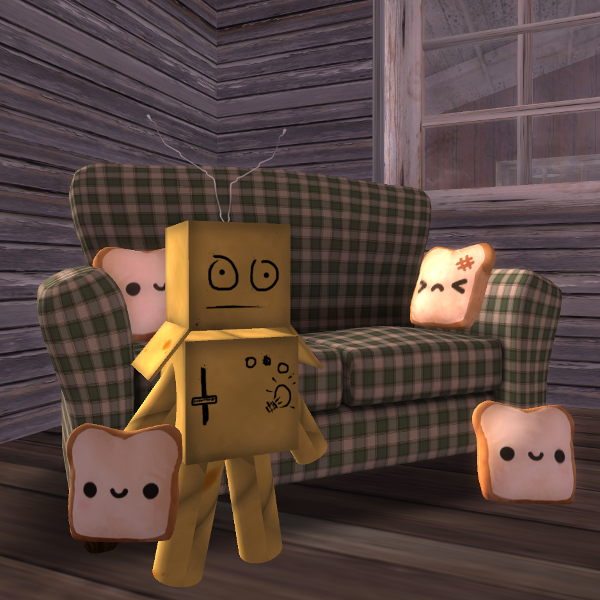 Me and my toasty friends. Oh yeah! The sofa is new, too! 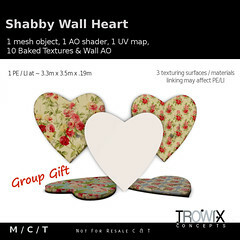 As always, you can find the group gift just inside the door to the Trowix Barn. Stop by with your group tag on and get toasty! More Loft items – Ancient History! 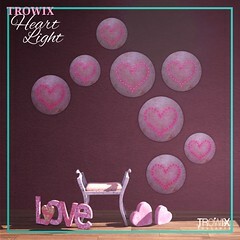 Trowix has put some of the older group gifts in the loft. This seemed a fair way for all concerned to have access to all the group gifts – new members and old, alike. If you missed one along the way, it will be up there! 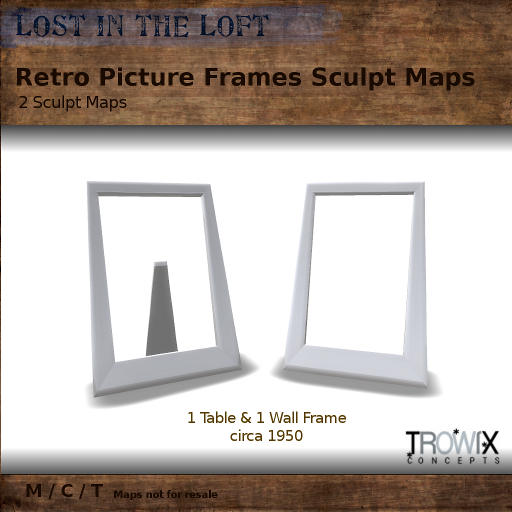 The loft you’re looking for is located here, at the Trowix Barn. 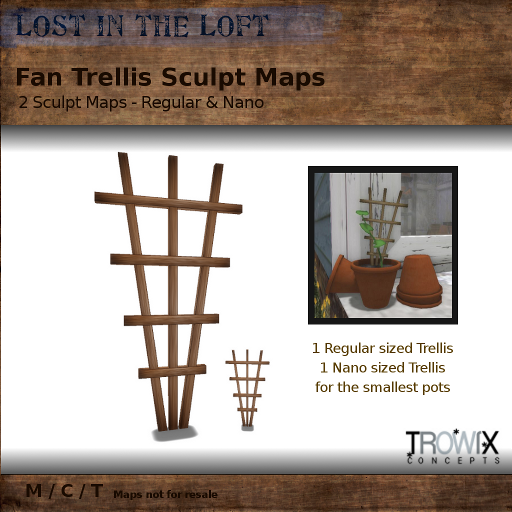 Lost in the Loft – Wonky Bargains! 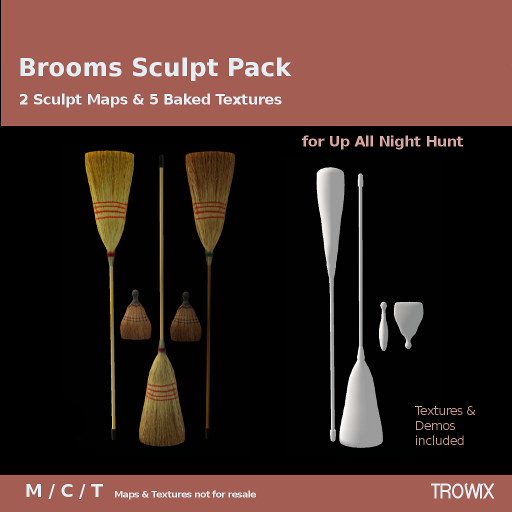 These sculpts are still use-able, useful and now — cheap! 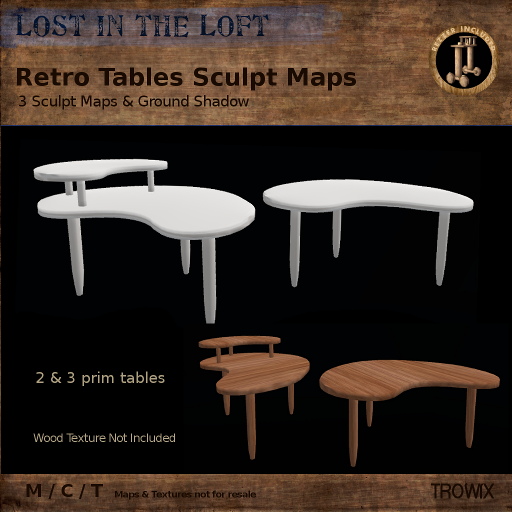 The first item in the loft is the “Retro Tables Sculpt Maps”. 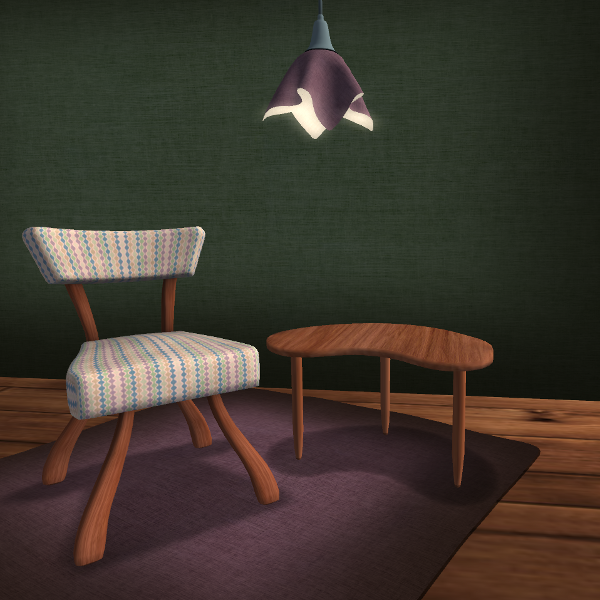 Cute, retro-y, Fallout-esque, 50s kind of tables made to go with our Retro Side Chair. Face it, you’d hide it somewhere, too! I really like that table — Why did they put it in the loft?! 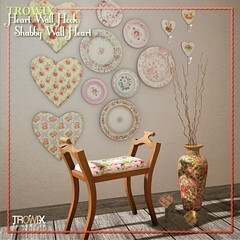 You can find these tables, in the loft, at the Trowix Barn. 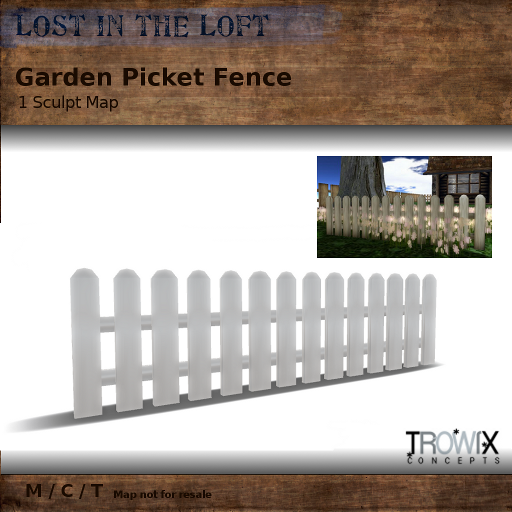 Only at the Trowix Barn – because Marketplace has no loft. 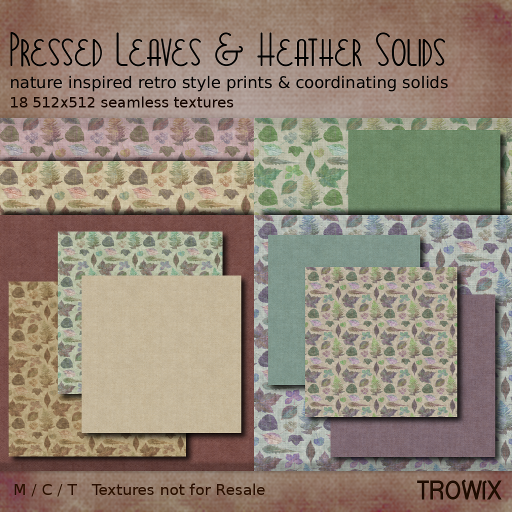 Pressed Leaves Retro Squares – Textures! 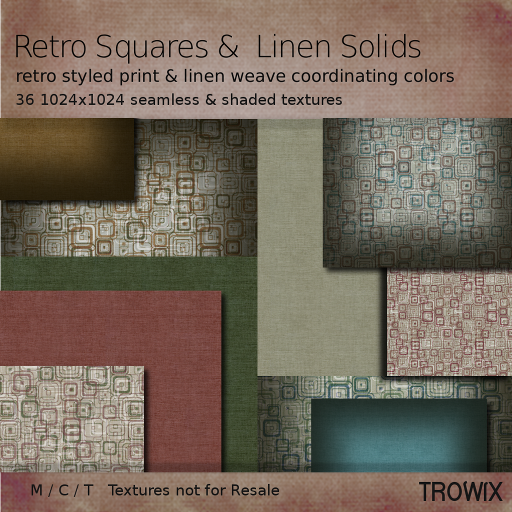 Retro inspired squares come packed with linen weave matching solids for a versatile designing combination. Mix and match colors for edgy or subdued warm looks. 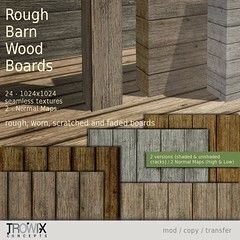 Seamless and shaded textures for your designing convenience. 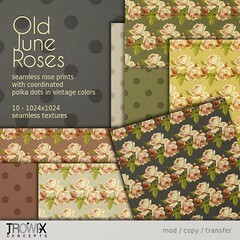 Naturally muted colors and heathery solids for mixing and matching will give lots of charm and creativity, too. Seamless textures make building easier and faster. 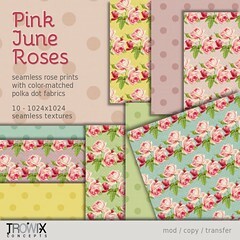 Wallpaper or fabric — Your choice! 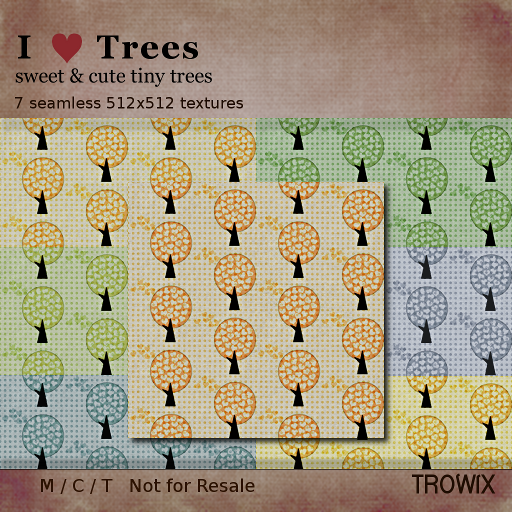 Some Retro Fall goodies for you from the Trowix Barn. 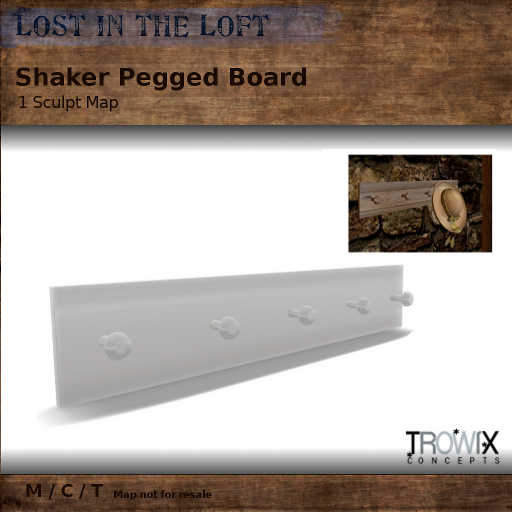 Also on Second Life Marketplace. Don’t forget we’re in the “Up All Night” hunt, too! 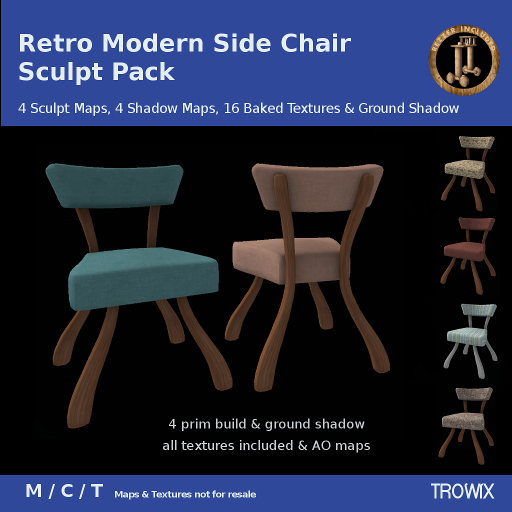 Retro Side Chair Sculpt Pack – Classy! 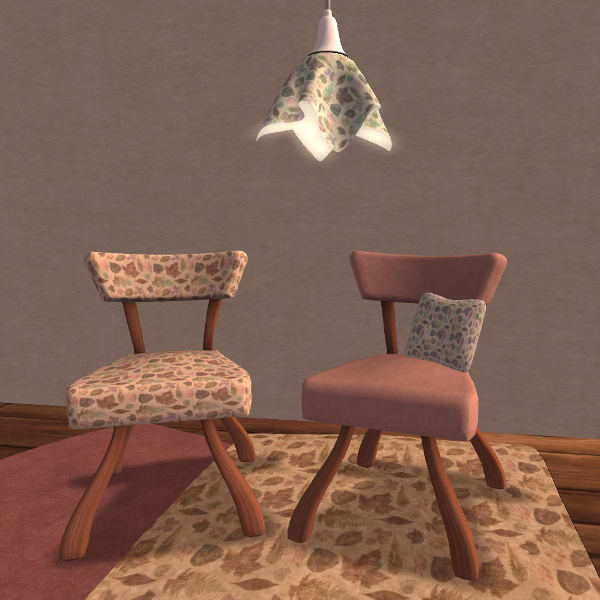 Inspired from thrift store and attic finds and designer showcases, this accent chair is fun, frivolous and funky. 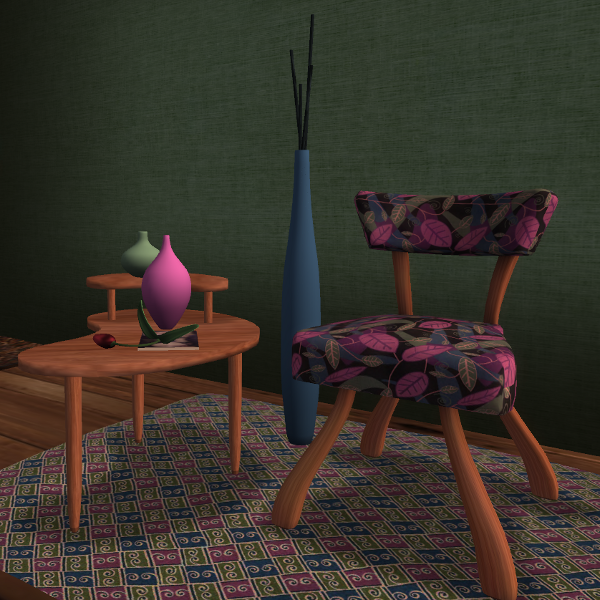 LOD2 components and included textures (some tintable) and shadow maps are featured in the pack adding to versatility. 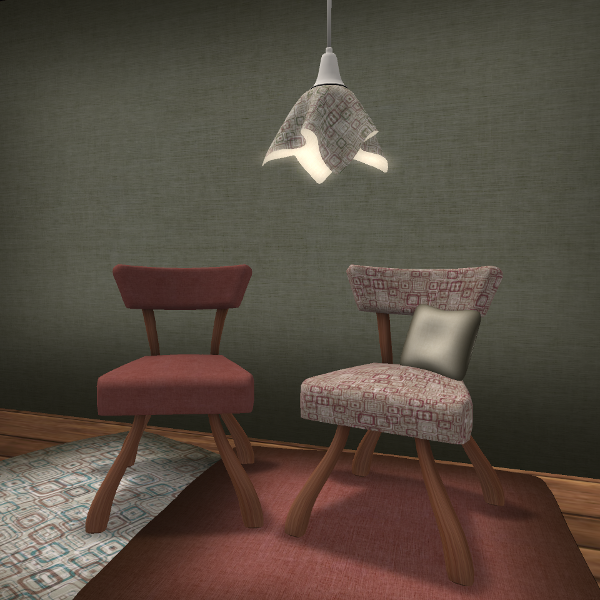 Carefully crafted to show off your colors and textures beautifully, we hope you’ll enjoy your retro chair. 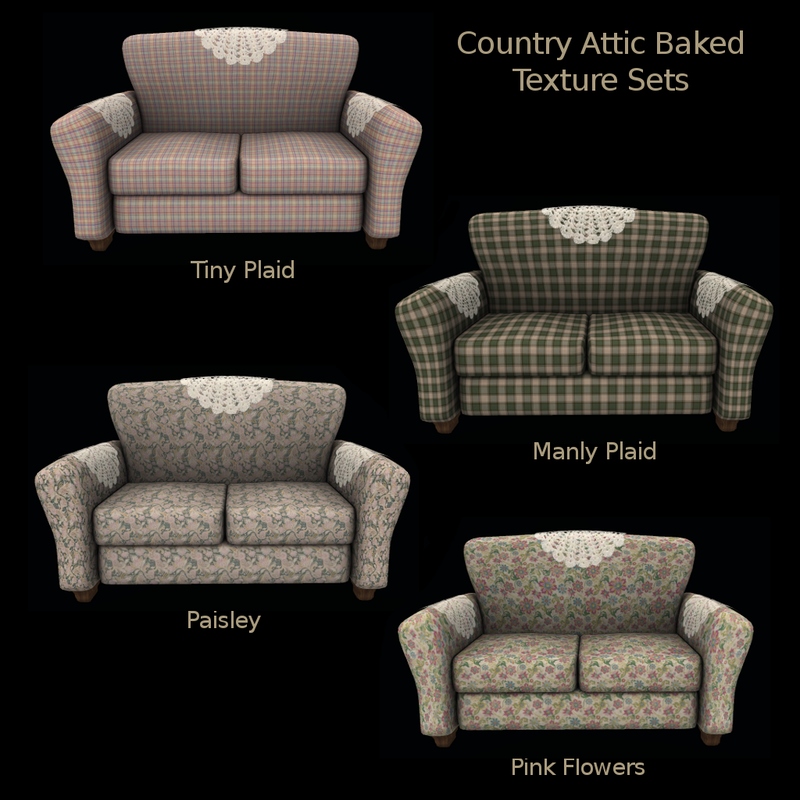 6 Baked Texture sets & Shadow Maps give you lots of options. 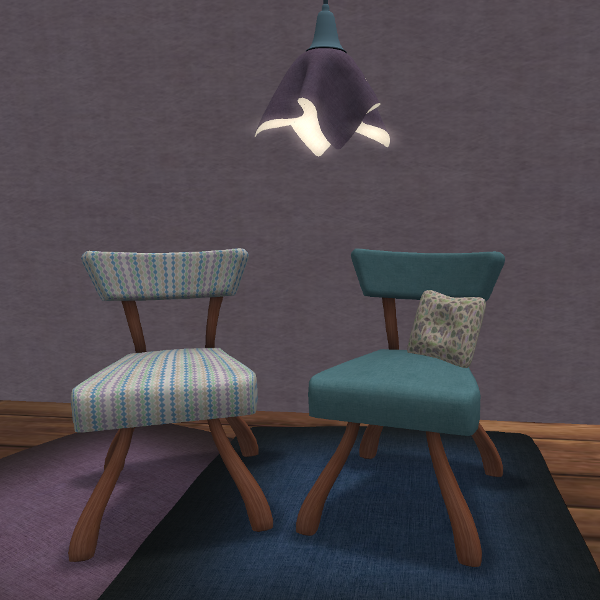 A classy, adorable accent chair to fit into so many places; entries, halls, bedrooms, bath, even outdoors. 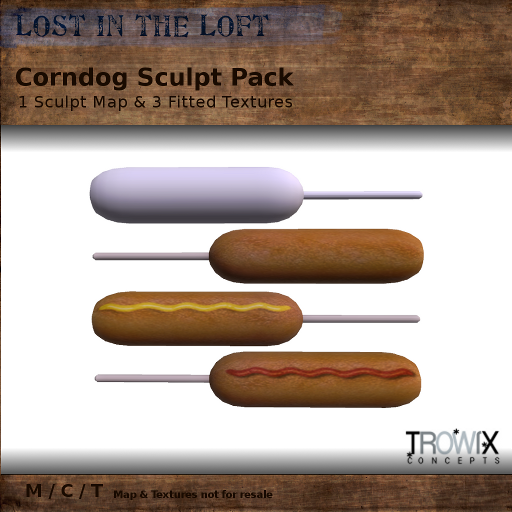 2 of the baked texture sets. You can see the included ground shadow. All they need is you! 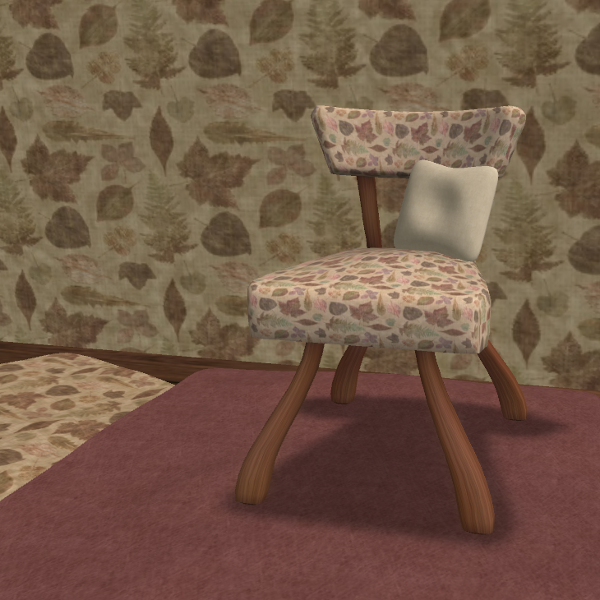 You’ll find examples of this chair, as always, at the Trowix Barn and on SL’s Marketplace. Just the touch in any season. The board is set to x / 25, so round up your friends for some free fun! ….or the texture pack is available to buy if you don’t want to wait. 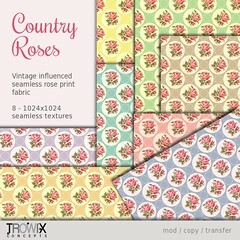 It’s here at the Trowix barn! Yay! We’re in another hunt, which means… another giftie for you! 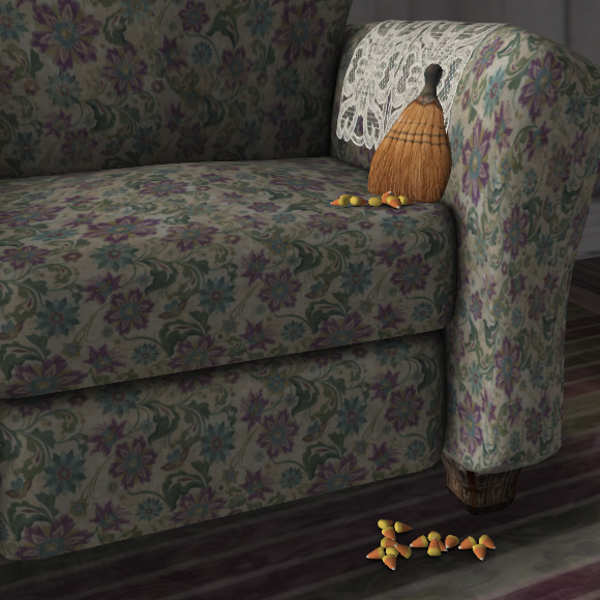 If you need to clean up after Halloween, this is one hunt prize you don’t want to miss. : ) The hunt runs through the month of November and has the option for hunters to pay L$10 for the hunt prize or hunt for it in the store. Choose your poison! Old & New brooms to keep you busy…all night. Halloween clean-up is quick with a pretty antique whisk! 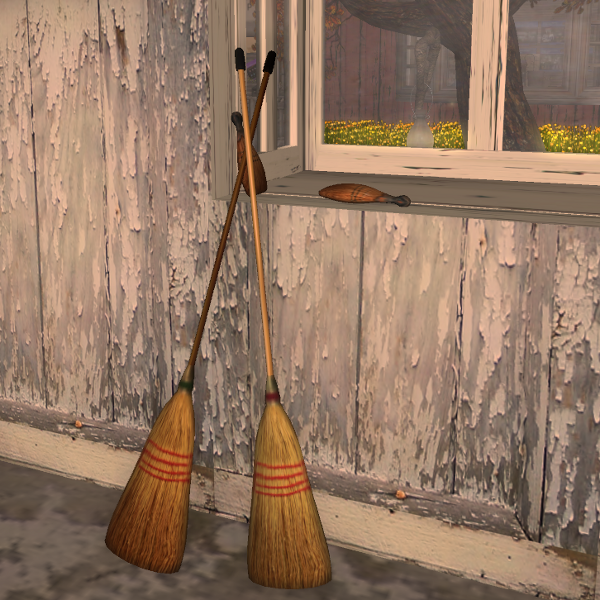 Brighten up a dusty corner with these 1 prim brooms! Join us, with your 10 little Lindens or sleuthing shoes, all night long during November at the Trowix Barn.